Luthor gave the Lovecraft clown his three-hundred-dollar daily consultation fee and had him blindfolded and deposited outside his Alexandria, Virginia home. Lightfoot seemed to know what he was doing. "It's quite fascinating," Dr. Lightfoot told Luthor once the linguist had a chance to study the Einstein document for a few minutes. "This is obviously not a foreign language but an altogether new language form. Look, there are no prepositions." Luthor did not quite know why this was significant, but Lightfoot seemed impressed. "And the conjunctions," Lightfoot said, his eyes wide, "at least I think they're the conjunctions. They seem to be tacked onto the subjects of clauses like prefixes." "Lord! This is fascinating!" Lightfoot marveled. Luthor was secure for the first time since he tore open the great prize in his meditation room. Lightfoot was the best there was at the science of languages. In days, maybe a week or two, Lightfoot would be able to give Luthor some idea of what treasure of knowledge it was that Einstein saw fit to preserve for the generation that followed his own. About an hour into Lightfoot's study he began pacing around the room and stopped making comments to Luthor at all. He would stand up, walk a few steps, occasionally bump into a chair or a priceless antique clock or a wall without noticing, then scurry back to the desk to scribble something in a notebook. Luthor decided it was time to leave him alone. As usual, the main hall of the penthouse was swarming with little groups of extremely competent specialists in different areas who had sold their respectability for creative freedom and lots of money. Luthor corrected a minor error in a calculation done by two young computer-data analysts. He looked over a hydraulic missile-launching ramp on the balcony that his crack mechanic was trying to repair and pointed out the problem to her. He was showing an employee who was a retired chemistry professor from Amherst how to produce Argon Tetrafluoride without combustion when the study door flew open. Luthor had no friends, really. He had a few cronies, a lot of employees and one enemy. He also had a few marks. One of his major talents was the ability to turn potential enemies, generally people who had something he wanted, into marks. Even Superman was a mark once, or was he a friend? People called him Superboy then, even though he was the same guy. When Luthor remembered anything that far back he usually made a point of doing so for the purpose of accumulating some anger in his system. Anger clouds the truth as surely as does love, terror, or grief. The Jefferson-Baker Science Contest was an annual competition that a large industrial corporation initiated when Lex Luthor was in grade school. Around that time, there was a good deal of fear in the American Corporate Empire that the nation's educational system was not capable of producing enough bright and creative scientists to maintain the country's technological preeminence over the coming generation. The people who owned and directed the Jefferson-Baker Corporation thought that it would be a good idea to allocate a certain amount of money each year for scholarships to the high school students who could, with limited resources and no adult assistance, produce the most original and ingenious new scientific or mechanical devices. Lex also thought that this was a good idea, and he realized that while the Jefferson-Baker Science Contest was never likely to single out the next Einstein or Edison or even the next Peter Goldmark, it was a fine way to strengthen the resolve of those remarkably talented young people who, through chance or politics or the mood of the judges, were not winners of scholarships. Young Lex Luthor, however, felt that his own resolve was already sufficiently strong to achieve greatness, and that he did not need to lose the contest. It would be nice, however, if he could pay his way through a university or technological institution of a stature he considered acceptable. Pop wasn't going to cough up the tuition, even if he could afford it. Lex would have to do it himself. The top Jefferson-Baker prize of ten thousand dollars would about cover it. Lex decided that, assuming his entry in the contest was arguably the most original and ingenious in the country, he could minimize his chances of losing by first considering what sorts of projects had won in the past and who this year's judges were likely to be and what they were probably interested in. After careful consideration he decided that, first, the projects that tended to win the big prize were generally flashy, usually expanded on a current popular fad in the scientific community and were easy to explain and show off to the public in magazines or on television, and, second, the panel of judges seemed to be weighted, from year to year, in the direction of scientific technicians—rather than theorists—who were more likely to be impressed with a clever demonstration of an old principle than with a wholly new idea. All right, Lex thought, if what they wanted was showmanship he would blow them all away. In November of the year Lex Luthor was in the ninth grade, three boys from his class showed up in the Waterville Valley High School gymnasium for the state eliminations in the Jefferson-Baker Science Contest. Out of a spinning silk ribbon and a copper toilet tank float, Pete Ross built a Van de Graaf electrostatic generator which could shoot tiny bolts of lightning at a flower box and, theoretically, stimulate the growth of plants. Clark Kent showed off a crude, nearly indescribable harness-and-pulley system which, Clark said, simulated for prospective space travellers the condition of low gravitation. A person in the harness would hang parallel to the ground, walk/swing along a wall like a pendulum, and feel as though he or she were hopping high off the ground/wall with each step. Lex's exhibit consisted of an empty platform with a sign off to one side that said, simply, "MAGIC." Students spent the morning setting up their projects, testing them out, standing back to admire the way they looked, checking out the competition to make sure no one had a better idea. Pete Ross, typical of the entrants in the room in that he was reasonably sure that he would win or that he ought to, asked Clark Kent if he had seen Lex at all that day. "I gave him a ride over here in my Pa's pickup," Clark said. Clark had a special daylight driving license so that he would legally be allowed to drive farm vehicles earlier than he would normally have been allowed to drive. Jonathan Kent had only recently sold his farm and the license had not yet expired. "Then he got here the same time you did? It's nearly one o'clock. What's he been doing?" "I don't know. The judges are supposed to come around at two." "Yeah. Every time I asked him what he's doing he wouldn't even tell me if he was entering the contest for sure. What'd he bring? Anything?" "Just a big steamer trunk. I had to help him carry it. Last I saw he was dragging it through that door behind his platform." "Really? You saw it?" Pete's apprehension was oozing up through his cool. "Did you see what he had in it?" "Yeah. He opened it once when I went to set up my I harness." "What'd he do? What was in it? What'd you see?" "Just the sign? Nothing else?" "Yeah. See? It says 'Magic.'" For awhile, nobody but Pete Ross and Clark Kent appeared to notice the empty platform among the eighty-two other exhibits that the entrants stuffed into the room. People walked by it, around it, generally ignored it. At about half past two the mother of one of the entrants walked over to the platform, hopped into the air, spun around and shrieked. "How dare—uhh," the woman looked behind her and down at the floor. "I thought there was somebody there. I saw him. He crouched behind me." People's heads turned, a few smiled. The people nearest the woman shuffled nervously. One man, evidently her husband, told her in a low voice that there was no one there and that she should calm down. "I saw him. I really saw him, plain as life. I think I saw him, a boy with curly brown hair. He must have run off into—no, I suppose he didn't." Just as the flustered woman seemed to be collecting her rumpled composure, as her husband's smile was becoming sincere, during what was probably the final moment most of the people in the big room were planning on paying more attention to Lex Luthor's platform than to any of the other exhibits, the woman's husband yelped. Lex Luthor was standing deferentially at the closed door behind the platform. No one but the man who yelped had been looking. "I wonder if I could have your attention for a moment," Lex announced. As he said this he appeared to step onto the platform and walk to the center of it, oblivious to the man who, with a hand clapped over his mouth, was leading his wife away. For the next several minutes no one in the room paid any attention to anything other than young Lex Luthor because the next thing he did was pull a rabbit out of the air. "I suppose you want to see me do that again, don't you?" "Well, it's a cardinal rule of magic," Lex explained, "that no self-respecting magician does the same trick twice in succession, at least not the same way. But then again, no self-respecting magician goes around without a top hat, so—"
Lex reached both hands into the air in front of him and feigned a surprised expression when a silk top hat appeared in his hands out of nowhere. There was, of course, a rabbit in the hat. "There you go, Pierre," he said as he put the animal on the floor next to its mate, "go play with Marie. Uh-oh, I think you two are getting along too well for a mixed audience. Shoo!" and the pair ran to the edge of the platform, where they again vanished into the air that had apparently spawned them. For the next fifteen minutes Lex mesmerized the crowd with his snappy patter and his ability to pull out of the air objects of increasing size—a pair of shoes, a full dress suit which he put on, tossing all but his skivvies into nowhere, a magic wand, a large radio, a steamer trunk—and throw them back again to vanish completely. For his last trick, Lex told the crowd to stay where they were, and made a running leap into his audience. He seemed about to land on the head of a startled man when he vanished. He floated back on to the stage, as if emerging from a hole in space, wearing his full dress suit and silk hat, riding the bare back of a brown mare an entire horse and rider, where nothing had been before. "She looked lonely, so I invited her along." As the amazed, applauding collection of people watched, a man hollered from the back of the room, "That's Elsa. You no-account little horse thief, what're you doing riding on my Elsa?" "I'm glad to know her name," the boy laughed as the irate farmer lumbered across the room and onto the platform. "I was hoping her owner would turn up. Adds just the right amount of drama to my finale, don't you think?" The man had been amused enough by the performance so far, but he was no longer in any mood for theatrics. His grandfather had told him that a horse thief was the lowest form of life on Earth and he believed everything his grandfather told him. His grandfather also told him he was awarded the Medal of Honor in the Civil War, although the old man was born in 1871. The farmer grabbed at his animal's bridle and nearly swallowed his chewing tobacco when his hand passed through it as it nothing were there. He grabbed for the horse's mane, for her neck, for the collar of Lex's jacket as the boy climbed off the animal's back. It was like clutching at a beam of light. It was exactly like clutching at a beam of light. "Please don't be angry, sir," Lex told the farmer who was now clawing at him, standing in the same space as the boy. "Maybe this is the best way to explain it. You might notice that Elsa and I don't cast shadows right now..."
Lex took the horse's bridle and walked to the side of the platform with her, seeming to disappear with her as they walked past a certain point in space. The door in front of which Lex had first appeared now opened from the inside. From behind the doorway Lex led Elsa, whole and healthy. "...but now we do. What you have just seen," Lex explained, "was a demonstration of holograms more sophisticated, I believe, than they have ever been constructed before. All of what you just saw were images, projections of what I was doing in a space I set up in a locker room behind that door. The voice that seemed to come from my projection actually came from a speaker I set up behind my 'Magic' sign." All but one of the six people who were judging the entries—they were all men—smiled their appreciation of the performance. The sixth wore a dubious look. Only one of the judges pretended to understand fully as Lex explained the system that allowed him to project his animate, live image into an adjoining room, and that judge was only pretending. Everyone else in the room except for Clark Kent and the farmer was clearly and completely impressed. Clark Kent knew about the setup hours earlier and had been impressed then. The farmer, grumbling, led his horse back to her stable a quarter-mile down the road from the high school. The one-thousand-dollar scholarship award for the state's best entry in the Jefferson-Baker Science Contest went that afternoon to Pete Ross. Lex was despondent. 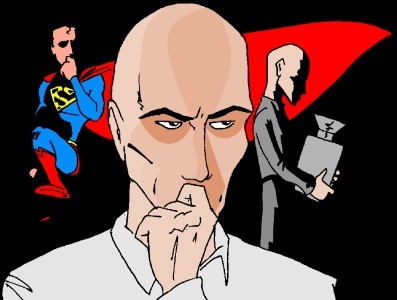 The dubious judge had realized that Lex was from Smallville and assumed that Superboy had helped him with his extraordinary entry in the science contest. It was likely, but it was not true. It was also technically not against the rules, since Superboy was not an adult. On the slim chance that Superboy had not, in fact, helped young Luthor, the judge convinced his fellow judges to give top honors to another boy from Smallville, Pete Ross, who had put together a very impressive project. The idea was for the judges both to be fair and to maintain the integrity of the contest. They did neither. Lex Luthor was raised on anger. Superboy was raised on responsibility. Superboy knew that it was not logical, but that it was quite proper, for him to feel responsible for Lex's loss of the prize. He was worried that the boy would do something self-destructive. Lex was more likely to blow up Waterville Valley. Superboy determined to soften the disappointment. The day after the contest, Superboy asked a Smallville alderman, Jonathan Kent, for a special building permit for a temporary structure on an acre of village property at the edge of town. The Mayor was scheming with the Board of Aldermen—unsuccessfully, as it would turn out—to make Superboy a paid public relations agent for Smallville, and the Board thought that this permit would be a good first step toward that end. Superboy got his permit a week later at a regular Board of Aldermen meeting. Within half-an-hour after the Mayor signed the permit there was a white and red, flat-roofed, one-story, forty-by-twentyfoot building on the lot. Superboy equipped the building with rare chemicals and minerals, deep freeze, compression chamber, centrifuge, an electrical generator fueled by the heat from a pocket of natural gas that lay seven hundred feet below Smallville, and every other useful gadget he could think of. Superboy set Lex Luthor down at the new laboratory's front door and wished him luck. The way Luthor now remembered it, his entry in the rinky-dink science contest and his faking of disappointment afterward were simply an elaborate scheme to get Superboy to build him a lab. Some weeks afterward, young Lex Luthor received two registered letters. One was from the Westinghouse Corporation, asking him to work for them the following summer, using their resources, helping to develop the new science of holography. The other was from the Criminal Court of Waterville Valley informing him that charges of horse thievery had been brought against him, and that his trial was scheduled for the beginning of the summer. By the summer, Lex Luthor would have more important things to worry about. The development of holography was set back at least a generation. Dr. John Lightfoot tromped out of the room, down the four steps into the main hall, walked across the room mumbling and looking down and scratching under his left ear all the time. He bounced off the glass door to the balcony, walked in two tight circles, and ran back to the study when his face lit up. A minute later Lightfoot called out, "Air! I need some air!" Like a photon out of quasar Luthor was at the study, where he slammed into the little philologist who was absently wandering through the doorway. As the two helped each other up the thought briefly skipped through Luthor's mind that Lightfoot felt very solid for such a slight man. "My God, Lightfoot, I thought you were dying." "I don't know. Emotional dissociation. What did you yell for?" "Air. It's stuffy as a faculty meeting in there. Can't I walk around somewhere and clear my head?" "Anywhere. The penthouse is yours." "I'm sure I'd fall off the edge. What's wrong with the street?" "The street isn't shielded. You'd be seen. I built a camouflage shield to cover the top of the building. From outside, from any angle, this looks like an ordinary penthouse apartment. I've kept this setup going for years." "You want to walk around on the roof with the air conditioning system screaming at you like a dying rhinoceros?" "Yes. The roof. May I take the document with me?" Luthor had Lightfoot and the precious papers with their torn lead casing escorted to the roof and left alone. Moments later a swirl of colors spun into the smiling form of Towbee. Lightfoot handed the document to the elf and with a splash of discordant sound the little philologist disintegrated into the instrument from which he had emerged just hours ago. Towbee took the time to materialize at the desks of several unstrung news reporters to inform them that he did not appreciate the manner in which art was vulgarly hawked on this planet. "My outrage grows each hour I stay; I'll leave your Earth without delay."